Built on the Unique SSV platform, this electro-pneumatic regulating valve features an IP converter as an integrated part of the actuator. Available in a range of plug designs with different Kv values. Used for accurate control of pressure, flow, temperature or liquid level in tanks. Also available in an aseptic configuration. 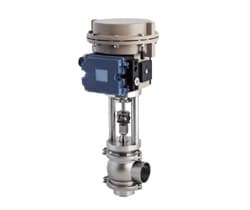 The Unique RV-ST valves are ideal for high-volume sanitary liquid processing applications where precision control of flow rate or pressure is required. These valves are EHEDG-approved. the Unique RV-ST regulating valve is authorized to carry the 3-A symbol.